Browse database objects such as schemas, tables, columns, primary and foreign keys, views, indexes, procedures, functions, and more. Edit SQL scripts. Run SQL queries. Auto column and auto table lookup. Uses the powerful EditRocket code editor that supports over 20 programming languages including SQL, PL/SQL, TransactSQL, SQL PL, HTML, Java, XML, and more. Visual tools to create, alter, describe, execute, and drop database objects such as tables, views, indexes, stored procedures, functions, triggers, and more. Includes multi-tabular display of queries with options for filtering, sorting, searching, and much more. Import data from various formats such as delimited files, Excel spreadsheets, and fixed-width files. Export data in various formats such as delimited files, XML, HTML, Excel spreadsheets, JSON, and SQL insert statements. Create select, insert, update, and delete SQL statements. Create multi-table joins. Includes a robust relational database (HSQLDB) that is up and running with no manual configuration out of the box. Insert, update, and delete table data in a spreadsheet like format. Find and replace data, preview generated SQL, and more. Compare table data across databases, or compare the results of queries. 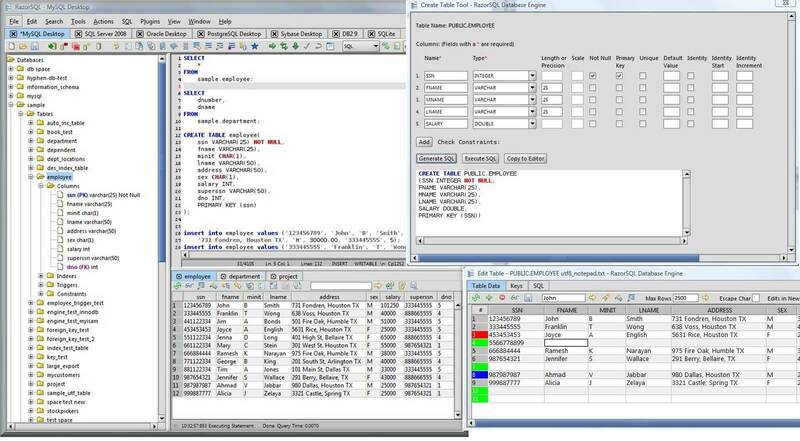 RazorSQL provides both easy to use visual tools and advanced features to allow users to do database browsing, editing, management, administration, and programming. Browse the database specific features or the complete feature reference. A Database Navigator for browsing database objects. 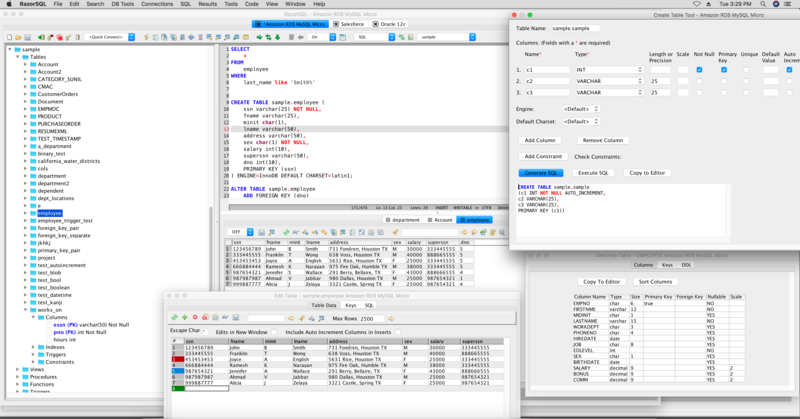 An SQL Editor for creating SQL queries. A robust programming editor that embeds the powerful EditRocket code editor that supports 20 programming languages including SQL, PL/SQL, TransactSQL, SQL PL, HTML, XML, and more. A Generate DDL Tool for generating table, view, and index DDL. Database Data Search tool for searching single or multiple database table and view data. Database Object Search tool for searching for database objects. Database conversion tools for many popular databases such as MySQL, Oracle, DB2, PostgreSQL, SQLite, MS SQL Server, and MS Access. EditRocket The text editor for programmers.